The lm1875 is a monolithic audio amplifier that offers a very low distortion and a performance of high quality for projects of audio amplifiers. The lm1875 supplies 20 watts in loads of 4 Ohms or 8 Ohms. 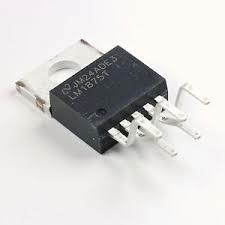 The LM1875 delivers 20 watts into a 4Ωor 8Ωload on±25Vsupplies. 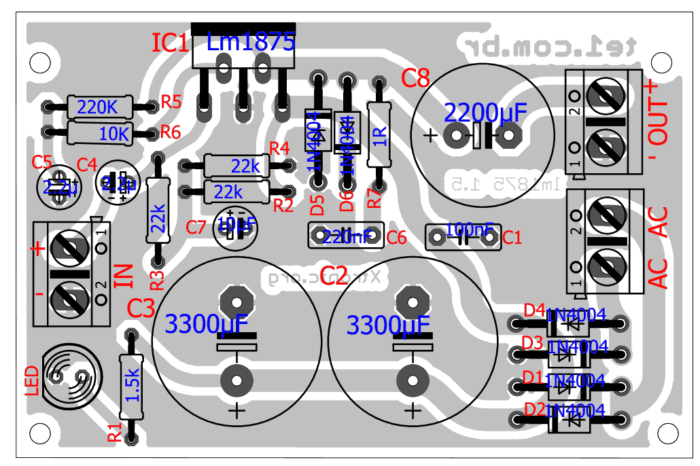 Using an 8Ωload and±30V supplies, over 30watts of power may be delivered. 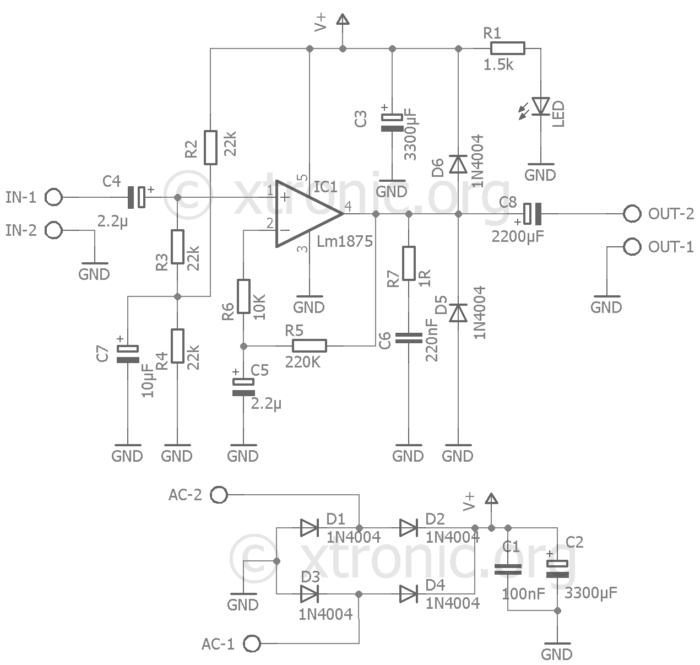 The amplifier is designed to operate with a minimum of external components. Device overload protection consists of both internal current limit and thermal shutdown.The LM1875 design takes advantage of advanced circuit techniques and processing to achieve extremely low distortion levels even at high output power levels. Other outstanding features include high gain, fast slew rate and a wide power bandwidth, large output voltage swing, high current capability, and a very wide supply range. The amplifier is internally compensated and stable for gains of 10 or greater. The LM1875 is designed to be stable when operated at a closed-loop gain of 10 or greater, but, as with any other high-current amplifier, the LM1875 can be made to oscillate under certain conditions. 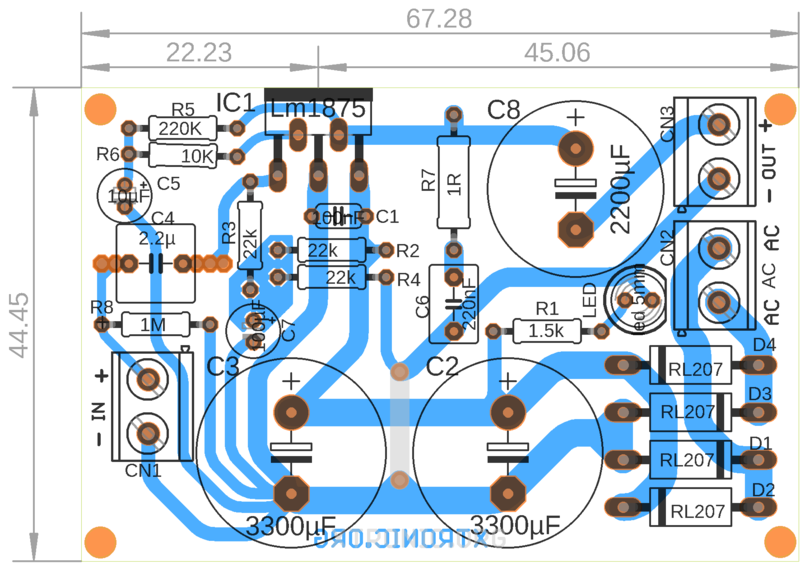 These usually involve printed circuit board layout or output/input coupling.Proper layout of the printed circuit board is very important.While the LM1875 will be stable when installed in a board similar to the ones shown in this data sheet, it is some times necessary to modify the layout somewhat to suit the physical requirements of a particular application. When designing a different layout, it is important to return the load ground,the output compensation ground, and the low level (feed-back and input) grounds to the circuit board ground point through separate paths. Otherwise, large currents flowing along a ground conductor will generate voltages on the conductor which can effectively act as signals at the input, resulting in high frequency oscillation or excessive distortion.It is advisable to keep the output compensation components and the 0.1mF supply decoupling capacitors as close as possible to the LM1875 to reduce the effects of PCB trace resistance and inductance. For the same reason, theground return paths for these components should be as short as possible. Occasionally, current in the output leads (which function as antennas) can be coupled through the air to the amplifier input, resulting in high-frequency oscillation. This normally happens when the source impedance is high or the input leads are long. 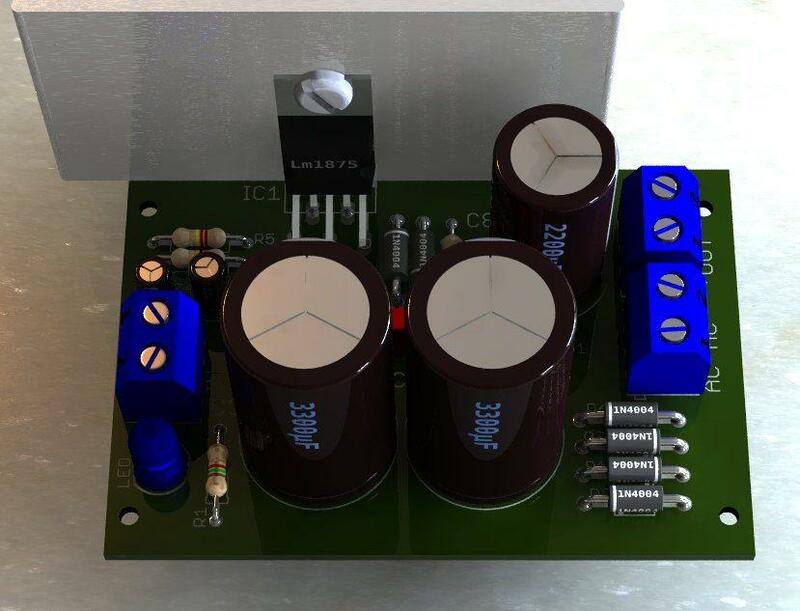 The problem can be eliminated by placing asmall capacitor (on the order of 50 pF to 500 pF) across the circuit input.Most power amplifiers do not drive highly capacitive loads well, and the LM1875 is no exception. If the output of theLM1875 is connected directly to a capacitor with no series resistance, the square wave response will exhibit ringing if the capacitance is greater than about 0.1mF. 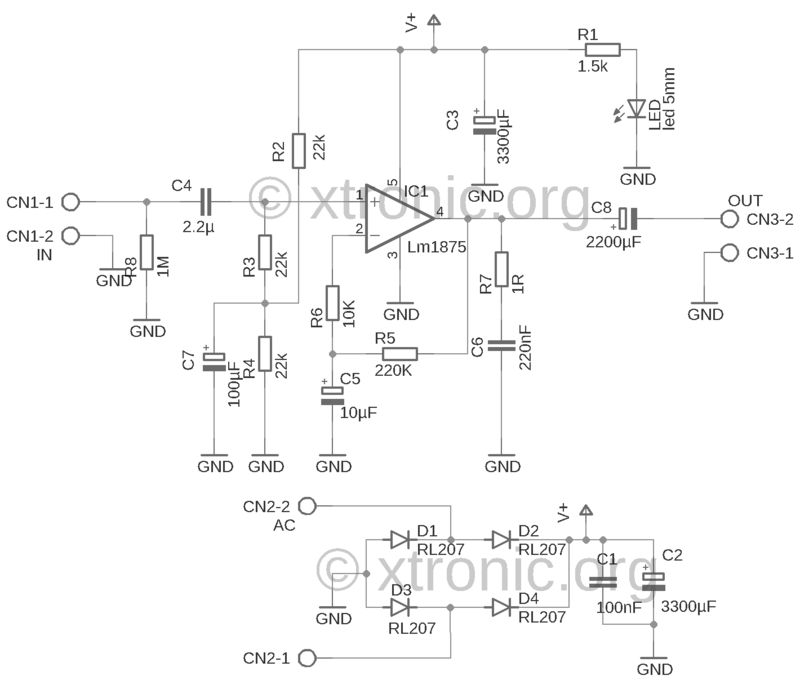 The amplifier can typically drive load capacitances up to 2mF or so with-out oscillating, but this is not recommended. If highly capacitive loads are expected, a resistor (at least 1X) should be placed in series with the output of the LM1875. A method commonly employed to protect amplifiers from low impedances at high frequencies is to couple to the load through a 10Ohms resistor in parallel with a 5mH inductor. Transformer 12 to 24VAc 2A. 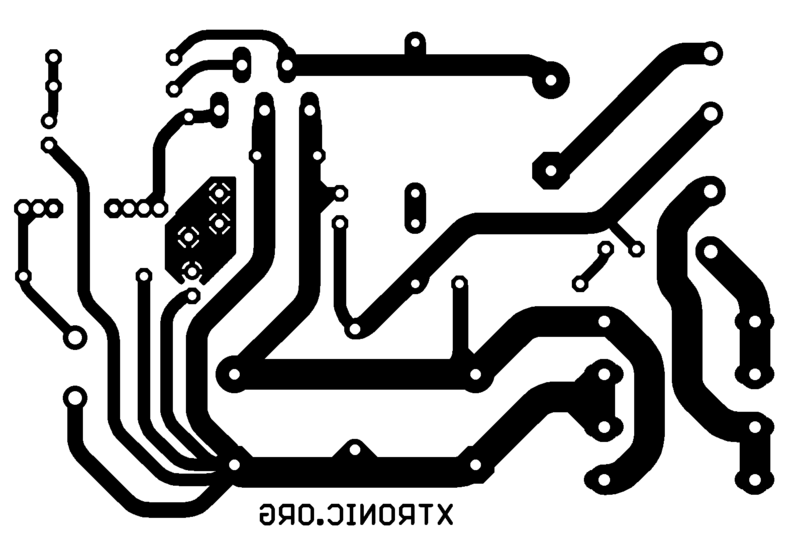 Diversos: Printed Circuit Board, Welding, Wires, Box, Heatsink to IC Lm1875, etc. 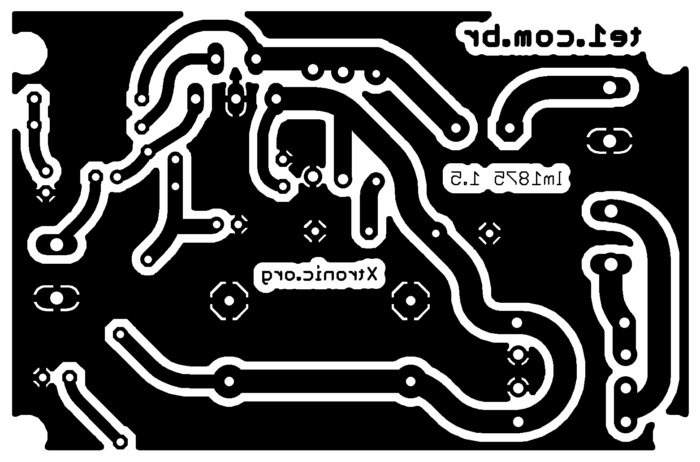 Download files for this project – PDF PCB, Schematic in PDF, silk screen. Is the LM1875 is the same as the TDA2030A and how do you power this amp, and does it have a potentiometer and what size well thank you.